Some very telling information has been seen in the GFXBench 3.1 database. Along side the usual NVIDIA entrants, is something new that hasn’t yet been announced. Something whose specs suggest a new tablet coming based on the X1 SOC. Hello there NVIDIA Shield Portable, what have we here? 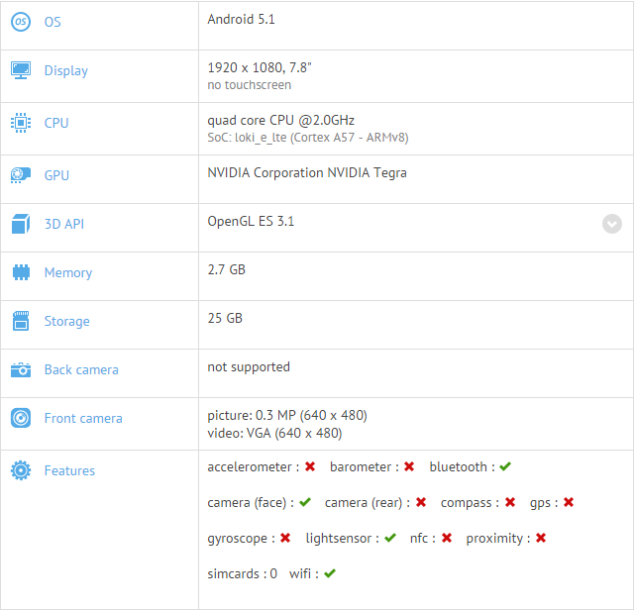 NVIDIA “Shield Portable” shows up in GFXBench 3.1 benchmark database, with specs that show a possible new tablet being tested. This could very well be the first glimpse of the future of the Shield line of tablets. All of the specs and the numbers indicate some very early testing of hardware The A57 based quad-core X1 at 2.0GHz is intact, with 2.7GB of RAM reported, just as much as with the Shield TV. It’s clearly a good deal faster than the already available Shield Tablet using the K1, which is definitely capable in its own right. If it is indeed the X1, then the performance delta between the Shield TV platform might be explained by increased thermal constraints imposed by a more portable platform. The specs too, indicate at least a development platform of some kind. Touch likely isn’t needed in the early stages of a development platform where thermal targets and performance are being fine-tuned. If they were going to have it connected to an external 7.8″ monitor for testing, the performance should then be on par with the Shield TV platform, because it would be far less thermally limited. Also, it’s reported to have things that would indicate a whole development platform, with a lightsensor and front camera. Those wouldn’t be necessary if just testing viability of a screen size. Now, this by no means indicative of anything at all. In fact, all it really tells us is that GFXBench has parsed through the available information available on an unknown hardware platform and has reported it to its public database. That’s all. It could be the second coming of the Shield Tablet, or it could be something else entirely. Perhaps if could also be a device by another manufacturer that’s using the X1. Acer might be looking to update their Predator tablet with the new SOC. We just can’t be sure until announcements are made. But the possibilities are endless, and perhaps now we can actually see the battery saving benefits of switching to a Maxwell GPU on the mobile side of things. The original Shield Tablet with the K1 was a fantastic introduction to the tablet space with good battery life and a surprisingly useful pen. I actually have one and use it for things other than gaming, because of that pen. Hopefully we’ll have more news regarding this soon, and perhaps even an announcement at some point in the near future. Before then, enjoy the development platform benchmarks and don’t hesitate to drool.